Every once in a while, we have a soap batch that goes awry. Whether it is ricing or separation, or forgetting a key ingredient, or a batch that gets too thick before we could pour it, we have all had a batch of soap that could use a do-over. I had a recent batch of soap that failed me. 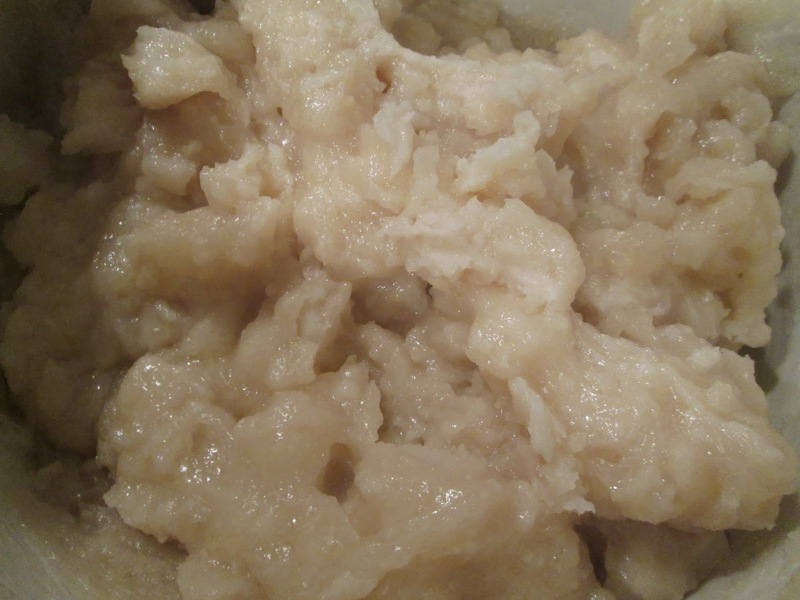 It came to trace nicely, but after I added the fragrance it started to curdle and separate. Previously when I’ve had this happen, I’ve been able to stickblend it back together, but this time it just wouldn’t stick. So, I poured the soap and hoped for the best…but when I pulled it out of the mold a few days later, the resulting soap was still soft and squishy, and the top seemed almost crusty. This was a 100% coconut oil soap, so it should have hardened up within a matter of hours from pouring. I double checked my calculations, and because I was positive the batch wasn’t just lye-heavy (which would have to have been tossed), I decided to rebatch this soap instead. To get a really smooth top, I overfilled the top slightly and then put a layer of clear plastic wrap on top and weighed down the top with a heavy object. Then, once the soap had cooled enough to cut, I sliced a thin layer off the top, so that it was even with the top of the mold. Have you had to rebatch soap, and what is your favorite go-to rebatch method? Your rebatch looks so smooth and the one with the embeds is a great idea! 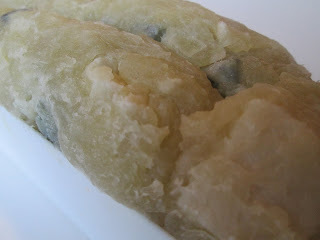 Coincidentally, my next post that I'm still drafting is on chopped up ugly soap made into embeds. 2 weeks ago I made beer soap with a sample fragrance and it became soap on a stick. I immediately transferred it to a slow cooker and hot processed it. I'm looking forward to reading about how you dealt with your soap Silvia, it's always good to have a back-up plan for these sorts of situations!!! I agree with Silvia, your rebatch looks so smooth, not anything like the rebatches I've seen before (dammit autocorrect, I do mean rebatch, not rematch). The embeds make a super cool point of interest to the soap, what a great idea! Thanks Monica, adding the extra water and oil really helps...the only downfall is that my cut soaps tend to warp a bit from the extra water evaporation; interestingly, the ones poured into the individual molds did not. 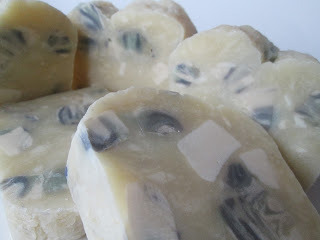 Super smooth rebatch soap! I rebatch in an old pot in the oven and it works great. I just don´t like to wait for the soap to melt. I have also started putting glycerin instead of castor oil. Do you use glycerin due to concerns about the castor oil cutting the lather? I haven't noticed that with using the castor oil, but I would definitely like to try the glycerin to see if there is a difference. Sometimes when I tried castor oil the rebatch soap had no bubbles. It was like fresh castile soap. That is why I prefer glycerine. I am glad that you saved this batch of soap. The soap turned out really smooth. 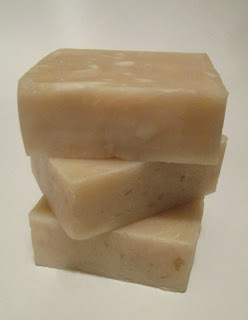 I obtained the best re batching results when I worked with fresh soap. It is easy to grind and there is no need for big amount of extra liquid. I used to add goat milk or glycerin as additional liquid when I re batched my soaps. That's true, I probably could have cut my water down because this was really fresh soap. I will also try goat milk and/or glycerin in the my next rebatch, thanks for sharing your tips! I wouldn't have guessed it was a rebatch soap, so smooth it looks! To be honest, I am not really into rebatching.. the ones I made were not hard enough and since that moment, the only way to use the failed soaps is to add them- cup in small pieces- at trace. Nice that you wrote about this subject, Christine, we always find something to learn from your experience. That's definitely another good option for using up a soap that doesn't work out, I've seen some beautiful confetti soaps! I remember this one from last year, it really looks like cp,or at least hp. I had an unusual soap case recently,when my soap was 'lye light' (as opposed to lye heavy). It was a complicated case cos my lye had gone bad /weak, but the point is that I can get my batter look smooth and very homogenous. I might post my experience, but I don't have much pictures to support the story. Wow, interesting Maja! How did you know the lye was weak...did the soap not set up properly? I would love to hear the story of what happened, that is something I haven't encountered yet! I'm another one who hasn't tried rebatching yet. That's not to say I haven't had any dud batches - I have had a few :-D - but fortunately none have been lye heavy and I've been able to grate it and make it into confetti soap. I've read a few posts that say a crock pot is a soapmakers best friend, even if you only do CP, so it's on my list of things to buy (as I don't think my husband would appreciate me using our kitchen one!). Once we've moved and (fingers crossed) I have a dedicated soaping area there will certainly be room for a HP/rebatching crock pot. Your rebatched soap looks awesome - more like CP than a rebatch. I'm so sorry, I missed these comments somehow! Thanks Anne-Marie! I can never seem to rebatch right. Which seems dumb considering how easy it is! So I shred the soap i need to rebatch and make a small bit of new soap, and stir in the shredded into it - them clump the whole thing into a log mold and only use it at home, because it doesn't look that great. Yours looks lovely, though! I'm glad the scent stayed around! Hi Lindsey, that's a really great way to incorporate your rebatch soaps as well...thanks for sharing that! I love how smooth it looks. The last time I did a rebatch mine came out pretty rustic :) Good job Cee! Dear Cee, I think that we could use this type of soap to make the top on cupcakes soaps, couldn't we? I don't see why you couldn't, it would be pretty warm to handle but you could scoop it on...it would definitely be worth a try, great idea Koutso!